I do not intend to waste much time over the next two weeks commenting on the inevitable nonsense that will emanate from the latest round of pointless climate talks. All the usual celebs will no doubt show up (having arrived by private jet, and then been transferred to their luxury hotels by fossil-fuel powered limousines): Angelina, Leonardo, Bono, Branson etc etc., and all the climate rent seekers will be salivating at the prospect of yet more funding diverted from solving real global problems to doing little for an imaginary one. Durban is even more of an irrelevance than Copenhagen or Cancun. At Copenhagen, there were genuinely high expectations of a global deal – and look what happened: abject failure. Cancun was a face-saving operation with a worthless “pledge” to keep global temperature rises under 2 degrees – as if you can simply turn a knob on the earth’s climate and it will obediently respond! And now Durban. Expectations here are so low they are negative. Failure again is a certainty. Nobody is focussed on climate change anymore – the world is suddenly faced with REAL problems. Financial crises that threaten jobs and livelihoods, and the engine of wealth creation that keeps our societies operating. Add to that the 5000-plus emails from Climategate 2.0, which show, beyond any shadow of doubt, that “the Cause” is kept afloat by a close knit cabal of fanatical warmists, who, in conjunction with compliant mainstream media organisations (including the ABC), will do anything to ensure that dissent is suppressed and uncertainties ignored. “Out of context” they cried in 2009. Not any more! Perhaps Mr FOIA, who has tantalisingly provided a locked archive of 220,000 further emails, may be persuaded to reveal the password if they complain about “context” much more. Wouldn’t that be a wonderful Christmas present? 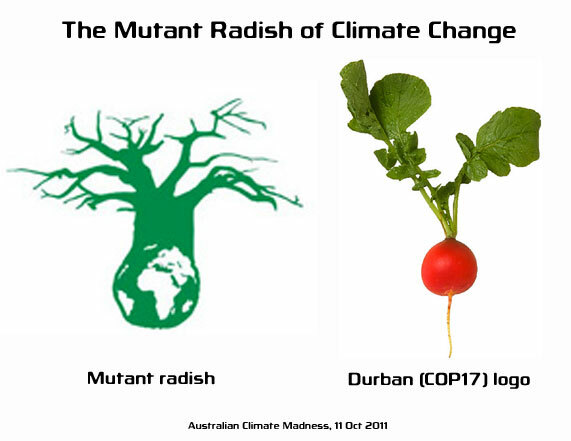 UPDATE: The Australian groupthink machine (otherwise known as the ABC) desperately tries to find an alarmist story to keep Durban relevant and “the Cause” alive despite all the collapsing wreckage of climate hysteria strewn around them. Why is it that those love-ins and arse-lickings are never held in places like Vladivostok or Redfern? Nothing but the best for our climate scammers ! Thanks to the e-mails, we now know that a university department (Tyndall Centre), well-known for its pro-AGW focus, had a BBC reporter (Harrabin) on its advisory board, and funded to the tune of £15,000 an activist group (CMEP), founded by the same BBC reporter, whose self-admitted sole purpose was to manipulate BBC coverage of climate matters. And there are still people out there who believe this is correct and proper procedure. Typical ABC. Frantically trying to flog their dead horse. When are you going to wake up to the fact it’s over…….no one cares any more about your globie warmie cult. So what does 1 ‘Ceba’ credit buy you … well one CEBA credit will cost you R100 (or approximately AUD$12) and equates to one Green Person Day for climate protection work. Starting to feel warm and fuzzy yet? So an example of one Green Person Day equates to 50 sq.m of vegetation clearing or 50kg of garbage collected. Wow … what a great idea. Let’s ask people to pay for what the municipal council should be doing anyway. So just who is this council? It’s the eThekwini Municipality of course. That’s the very same council organisation that is involved in corruption and scandal and the very same council that is a ‘Partner’ in CEBA Carbon Credits. Oh dear! so a quick trip to Durban via google earth shows durban to be a huge metropolis the size of boston ma….and we should pay credit because? I bet Juliar and Greg can’t wait to get to Durban to tell all their Euro warmist comrades all about Austrlia’s brand new voter proof carbon tax. Mayby they can give them some advice on how to bypass the electorate on the issue by completly lying about it’s introduction a week before the election.The thought of Combet or Juliar big noting themselves in the foyer during the coffee breaks from the warmist talkfest is almost to much to bear. Be very wary of few headlines coming out of this. While the table banging goes on in the front room – the backroom boy will be at work, creating words that will bind, but which are supposed to be a common set of things agreed at the conference. They have been taking lessons from the EU, where each set of “agreed Communications” or “treaties” ties the nation states hands just a little more – and believe you me, the EU is very determined when it comes to acquiring extra powers. So, take a very careful look at the text – just what is it that everyone has signed up to? It may not sound much, but it will be another notch or two.